Central American migrants sit on top of the border wall on the beach in San Diego during a gathering of migrants living on both sides of the border, Sunday, April 29, 2018. 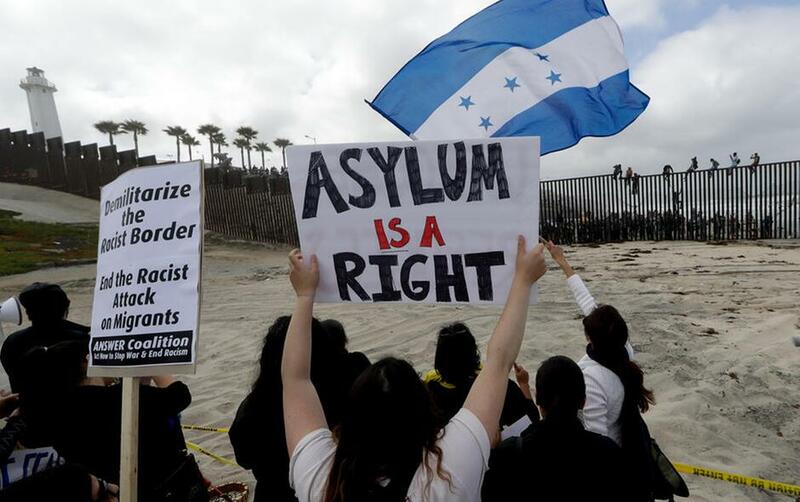 TIJUANA, MEXICO (AP) — The Latest on a caravan of Central Americans seeking asylum in the United States (all times local): 4:15 p.m. About 200 Central American migrants who traveled in a caravan and planned to try to seek asylum in the U.S. has arrived at San Diego's border crossing. But U.S. officials announced before they arrived Sunday that the San Ysidro port of entry had reached capacity. Rodulfo Figueroa, the top Mexican immigration official in Baja California state, told caravan organizers to send in an initial group of 20 migrants to see if U.S. border inspectors would entertain their request for asylum. Figueroa said he doesn't know if they'll be allowed in and hasn't received word from U.S. immigration officials. The caravan has criticized as a threat by the Trump administration. The migrants marched a short distance through downtown Tijuana and across a bridge to the nation's busiest border crossing, many carrying Honduran flags and chanting. An attorney working for a caravan of Central Americans has expressed disbelief that U.S. authorities say they cannot process more asylum seekers at the San Diego border crossing until its backlog eases. Lawyer Nicole Ramos said at a news conference that U.S. Customs and Border Protection knew the migrants were going to arrive at the U.S.-Mexico border Sunday and failed to prepare with sufficient agents and resources. Despite the news, about 200 people who planned to turn themselves in and seek asylum still started walking toward San Diego's San Ysidro crossing. U.S. officials have said the nation's busiest border crossing can hold about 300 people at a time. The caravan got attention after President Donald Trump and members of his Cabinet called it a threat to the United States. U.S. officials say San Diego's border crossing has reached capacity even before a caravan of Central American migrants criticized by the Trump administration began turning themselves in to seek asylum. A statement Sunday from U.S. Customs and Border Protection says the nation's busiest border crossing can take in additional people as space and resources become available. Nearly 200 Central Americans who have spent a month traveling in a caravan through Mexico planned to seek asylum Sunday. The caravan got attention after President Donald Trump and members of his Cabinet called it a threat to the U.S.
Officials had warned that San Diego's San Ysidro crossing may not be able to take asylum seekers if it faces too many at once. The agency has said the port can hold about 300 people temporarily. Organizers say nearly 200 Central American migrants who traveled in a caravan of asylum seekers to the U.S.-Mexico border have decided to turn themselves in to U.S. authorities. Bliss Requa-Trautz of the National Day Laborer Organizing Network says they're getting a final briefing Sunday before heading to the San Diego border crossing to seek asylum. If border inspectors say they don't have staff and space to accommodate that many people at once, organizers say they'll put women with children and children traveling alone at the front of the line. The rest will stay in Mexico and try another day. Heather Crone of advocacy group Show Up for Racial Justice says she's found 80 people across the U.S. who agreed to sponsor caravan members if they're released while their petitions are pending. Asylum seekers are often released to family in the U.S. but some don't have any and seek sponsors. Central Americans in a caravan of asylum seekers that traveled through Mexico to the border with San Diego are receiving final information before they turn themselves in to U.S. authorities. Caravan organizers gave the migrants a final briefing Sunday that was closed to the media before they head to the nation's busiest border crossing to seek asylum. President Donald Trump has been tracking the caravan, calling it a threat to the U.S.
Wendi Yaneri Garcia says she's confident she'll be released while her asylum case is pending because she's traveling alone with a 2-year-old son who's been sick. The 36-year-old said police in her hometown of Atlantida, Honduras, jailed her for protesting construction of a hydroelectric plant. She says she received death threats after being released. She says she just wants to work and raise her son and was excited to try her luck in the U.S.
Central Americans in a caravan of asylum seekers that traveled through Mexico to the border with San Diego have left a cross-border rally as they prepare to turn themselves in to U.S. authorities. Hundreds of migrants in five old school buses planned to eat lunch Sunday before making a roughly 15-minute walk to San Diego's San Ysidro border crossing, the nation's busiest. Many are fleeing violence in their home countries and will ask the U.S. for asylum. Supporters rallied on both sides of the border with a fence between them. Some climbed the wall to sit or wave signs under the watchful eyes of U.S. Border Patrol agents. With people rallying on both sides of the U.S.-Mexico border to support a caravan of Central American asylum seekers, one of those planning to turn herself in to U.S. authorities says she feels hopeful. Maria de Los Angeles said Sunday that she felt confident after speaking with an attorney that she'd be released while her case winds through the courts because she was traveling alone with her 1-year-old son. The 17-year-old hoped to move in with a sister in San Francisco and said she believed "everything will work out." She said she fled her home in Honduras because the father of her son threatened to kill her and their child. Some supporters have climbed the wall separating San Diego and Tijuana to sit or wave signs under the watchful eyes of U.S. Border Patrol agents. Before buses arrived at the rally Sunday at a fence that reaches to the ocean, about 100 supporters on the Mexican side of the border marched along the beach, shouting "Alerta" (attention) to the sound of a drumbeat. More than a dozen climbed a roughly 18-foot-high border wall under the watchful eyes of Border Patrol agents. About 50 supporters watched on the U.S. side, where they were held about 20 yards away. The Central Americans will test the administration's tough rhetoric when they begin seeking asylum at San Diego's San Ysidro border crossing. Central Americans in a caravan of asylum seekers that traveled through Mexico to the border with San Diego have filled five old school buses as they prepare to turn themselves in to U.S. authorities. Police with flashing lights escorted the buses through the streets of Tijuana to a cross-border rally on the beach, with supporters gathering on the U.S. side of the fence. U.S. immigration lawyers are telling Central Americans in a caravan of asylum-seekers that traveled through Mexico to the border with San Diego that they face possible separation from their children and detention for many months. They say they want to prepare them for the worst. The Central Americans will test the Trump administration's tough rhetoric criticizing the caravan when they begin seeking asylum Sunday at San Diego's San Ysidro border crossing, the nation's busiest. U.S. Customs and Border Protection says the San Ysidro crossing may be unable to take asylum-seekers if it faces too many at once, forcing people to wait in Mexico until it has more room.